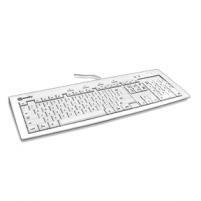 The Slim USB Keyboard for GNU / Linux is a stylish & clean white slim keyboard. Enhanced low profile keycaps reduces key stroke travel distances and eases pressure on your finger tips. Unlike most keyboards there is no super key (Microsoft Windows)! Note: This item requires a special shipping quote for any customer located outside of the United States due to the high cost of shipping.